These rules combine elements of two great fantasy RPG systems—the Dungeon Crawl Classics Role-Playing Game and Dungeon World—by taking the “0-level Funnel” experience of DCC RPG and adapting it to the Dungeon World ruleset. As such, you need a copy of the Dungeon World rules to play. 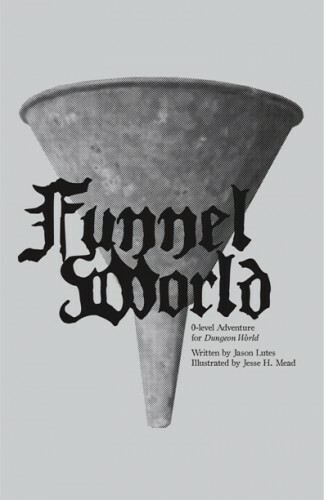 This 28-page, digest-size pdf includes rules for rolling up completely random Villagers, from name to occupation to character traits; guidelines for creating their home village; GM guidelines for running a Funnel in Dungeon World; 4 “Funnel Starters” to set an evening of improvisational medieval survival horror in motion; and a “Funnelography” of Funnel adventures available for purchase elsewhere. A Funnel is an adventure in which the player-characters start as a motley crew of ordinary villagers who find themselves in extraordinary circumstances; common folk thrown into a crucible of death and terror, who struggle merely to come out the other end in one piece. Many, and sometimes all of these poor souls die horrible deaths over the course of a Funnel adventure, but those lucky enough to survive are transformed by the extremity of their experience. While most fantasy RPGs start the PCs off as heroes, a Funnel adventure concretely demonstrates how common folk become heroes. It is their origin story.